A well-seasoned stuffing and the simple pan gravy make this whole roasted chicken a dinner fit for a king. The chicken is coated with some butter and seasonings and then roasted to perfection with the savory stuffing. The chicken is an excellent roast to serve for Sunday dinner or a holiday meal. Add cranberry sauce and mashed potatoes for a spectacular feast. The stuffing is a simple, fresh breadcrumb mixture. Feel free to replace the soft breadcrumbs, thyme, and parsley with store-bought seasoned breadcrumbs. If you like sage in your stuffing, add some ground sage, to taste. Even if you're cooking for two, a whole chicken is a great choice. Use leftovers to make sandwiches or use it in casseroles, soups, or salads. Or make a second meal with the leftover chicken, gravy, and stuffing. 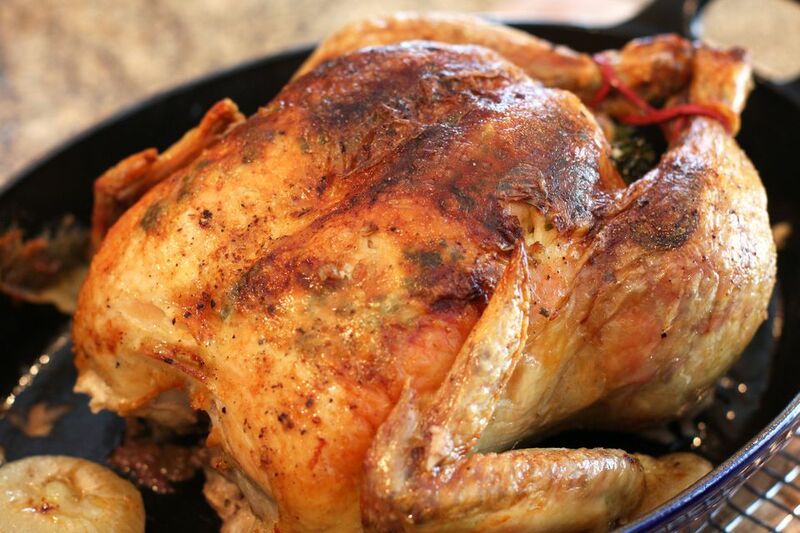 Note: while there are multiple steps to this recipe, this roasted chicken dish is broken down into workable categories to help you better plan for preparation and roasting. Heat the oven to 375 F (190 C/Gas 5). Line a roasting pan with foil and set a rack in the pan. Melt 1 tablespoon of the butter and cut the other one into small pieces. Rub the chicken all over with the melted butter. Tuck the pieces of cold butter under the skin along with some fresh herbs, if desired. Melt a 1/4 cup of butter in a skillet or sauté pan over medium-low heat. Add the chopped onion and celery. Cook, stirring, for about 5 minutes, or until the onion is translucent and the celery is crisp-tender. Add the dried thyme, parsley, and breadcrumbs. Add about 1/4 cup of milk and stir to blend. At this point, before you add the egg, taste and season the stuffing with salt and pepper. Stir in the beaten egg and enough additional milk to make a moist mixture. Loosely spoon the stuffing into the cavity of the chicken. Close the cavity by sewing the loose skin together with twine or cover the cavity with a piece of foil or a slice of bread from the heel. Place the chicken, breast-side up, on the rack in the roasting pan. Roast the whole chicken in the preheated oven for about 1 hour and 30 minutes to 1 hour and 45 minutes, basting several times with the pan juices. The internal temperature of the thickest part of the thigh and in the center of the stuffing must reach the minimum safe temperature of 165 (73.9 C). Let chicken stand for about 15 minutes. While the chicken is resting, make the pan gravy. Pour the drippings into a fat separator or pour them into a bowl and skim off the fat. Put 3 tablespoons of fat back in the roasting pan, reserving the remaining drippings for the next step. Add the flour and stir to make a roux; cook, stirring, for 2 minutes. Put the separated drippings in a 2-cup measure and add the chicken stock to the 2-cup mark. Gradually stir the chicken stock and drippings into the roux mixture. Continue cooking until thickened, stirring constantly. Taste and season with salt and pepper, as desired. Carve the chicken and serve with cooked stuffing and pan gravy. Never remove the stuffing from the chicken before it has reached the safe temperature of 165 (73.9 C). The chicken must be cooked until the stuffing comes to that temperature even if the chicken has passed 165 (73.9 C). Insert an instant-read thermometer into the center of the stuffing to ensure it has reached the safe temperature. Remove the stuffing to a serving bowl after the chicken has rested. Remove cooled leftovers to shallow containers within 2 hours of cooking; store in the refrigerator for up to 3 to 4 days. Reheat leftovers to at least 165 (73.9 C). Replace the thyme in the stuffing with poultry seasoning, to taste.